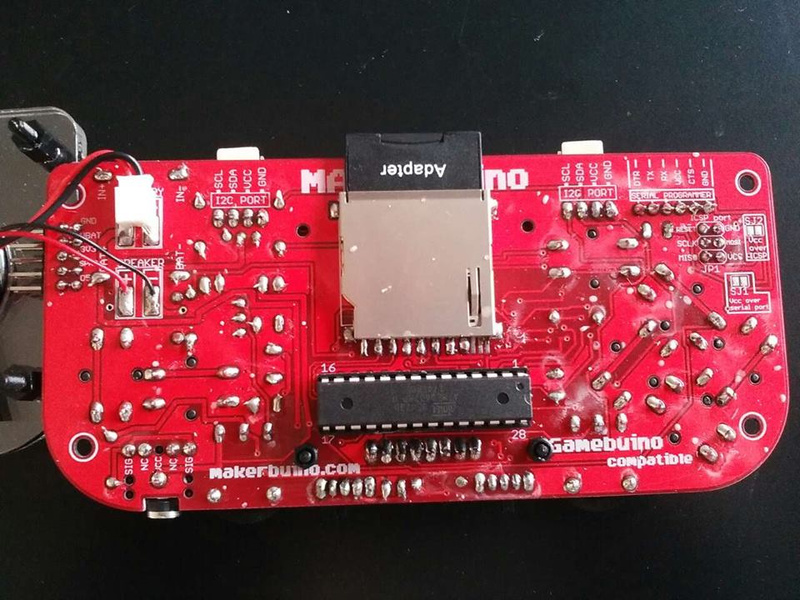 When I finished to assemble my makerbuino (which is, by the way, an amazing idea !!! ), it worked. I played with it during a long time and everything was fine. But the next day when I wanted to turn on, the screen displayed nothing, there were only the backlight and the sound. I tried to reset (with button C) but no changes. I checked my solder but I’m not an expert so I’m not sure. Can you help me ? I am sorry for the problems that you’re experiencing. Are you 100% sure that you followed the steps accordingly? (It is very important that you power-on the console while holding the C button). Also, did you try to reinsert the SD card a couple of times and blow in your SD socket really hard (this will clean the dust particles in the socket). After that, try doing the hard reset again and tell us what happens. I followed the steps and it worked again but then the screen turn off while I was playing. I did again the process but no changes. Maybe my solders aren’t well made… I don’t know what to do. Any others suggestions ? I decided to send it back ! You will receive it approximately wednesday. I hope you will find why it doesn’t work. Think you for your help ! I’ll look into it as soon as it arrives. What didn’t work ? It was the screen or my solders ? Hi @Marine, I’m glad that you’ve received it and that it’s working now. I don’t precisely recall but I think I had to resolder some joints underneath the screen (on the microcontroller socket). Anyways, if anything suspicious starts happening again, tell me!